This article is about the unincorporated community in Bucks County. 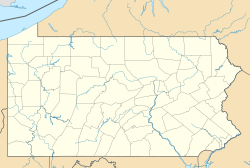 For the township it is located in, see Hilltown Township, Bucks County, Pennsylvania. Hilltown is an unincorporated community in Hilltown Township in Bucks County, Pennsylvania, United States. Hilltown is located at the intersection of Pennsylvania Route 152 and Broad Street. ^ "Hilltown". Geographic Names Information System. United States Geological Survey. ^ Bucks County, Pennsylvania (Map) (19th ed.). 1"=2000'. ADC Map. 2006. p. 2921. § B8. ISBN 0-87530-774-4. This page was last edited on 13 January 2018, at 22:38 (UTC).